The oval-shaped larvae are grayish-green and have a ring of spines arranged crown-like around the edge of their bodies. The larvae sport a pair of spike-like appendages (cerci) at the tip of their abdomen which they use to spear and carry an odious collection of feces and shed exoskeletons in an umbrella-like fashion over their bodies; presumably for protection against predators. Both the adults and larvae consume the upper or lower leaf epidermis and leaf mesophyll leaving behind the epidermis on the opposite side of their feeding site. Feeding damage first appears as irregularly shaped depressions with one leaf epidermis still intact producing what looks like a window pane. Eventually, the intact epidermis dries and drops from the leaf to produce holes. This weed-whacking beetle was intentionally imported from Europe and northern Asia into North America as a biological control for thistle. 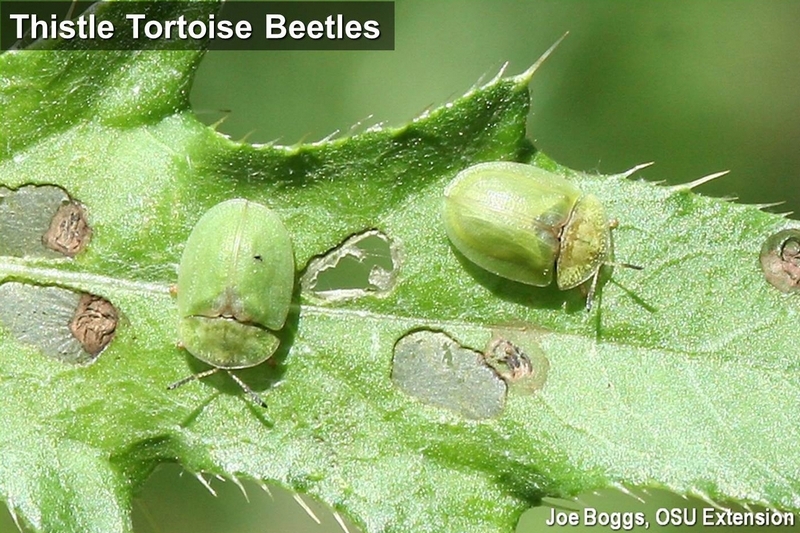 The beetle is also known as the "thistle defoliating beetle" and it feeds on other non-native thistle-nasties including musk (Carduus nutans) and plumeless (C. acanthoides) thistles. This is a very good non-native beetle!